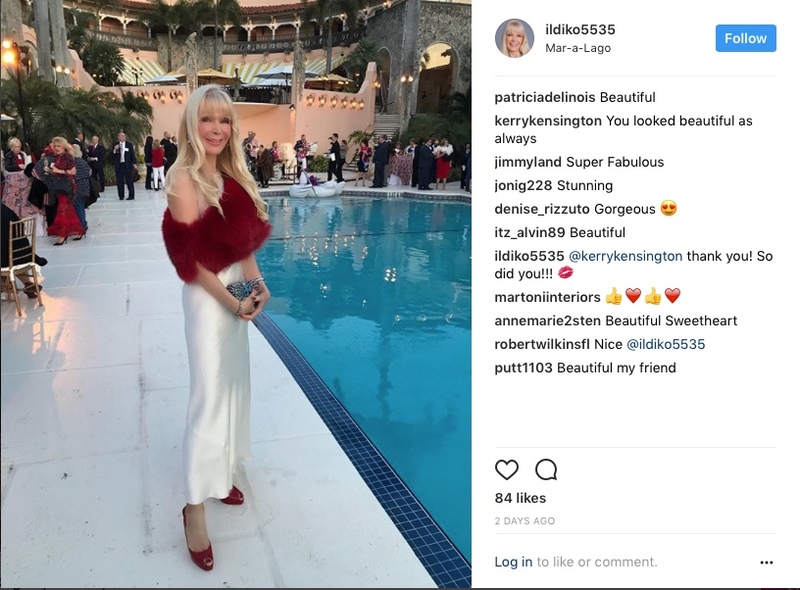 Contributed by Sharon Butler / This weekend, as hundreds of thousands of mad pink-hatters gathered around the world to protest the underhanded, misogynistic, and essentially anti-citizen agenda of the Koch-fueled, Putin-assisted Republicans, a very small segment of humanity who supports the chaotic mafia-style GOP government gathered at Mar-a-Lago to celebrate the completion of Trump’s first, and hopefully last, full year as president. 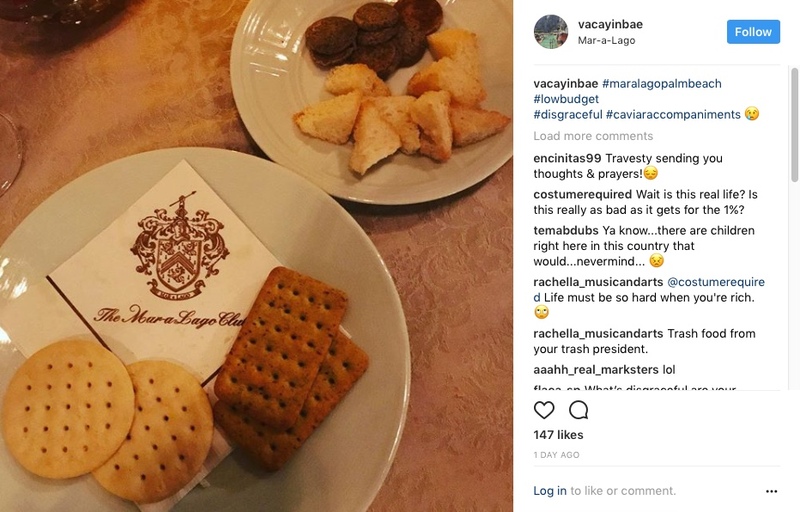 Even though the government had shutdown earlier in the day due to Trump and the GOP’s inability to get a budget deal inked, the lavish party, in damning let-them-eat-cake fashion, proceeded as planned at the Trump Organization’s private seaside club. 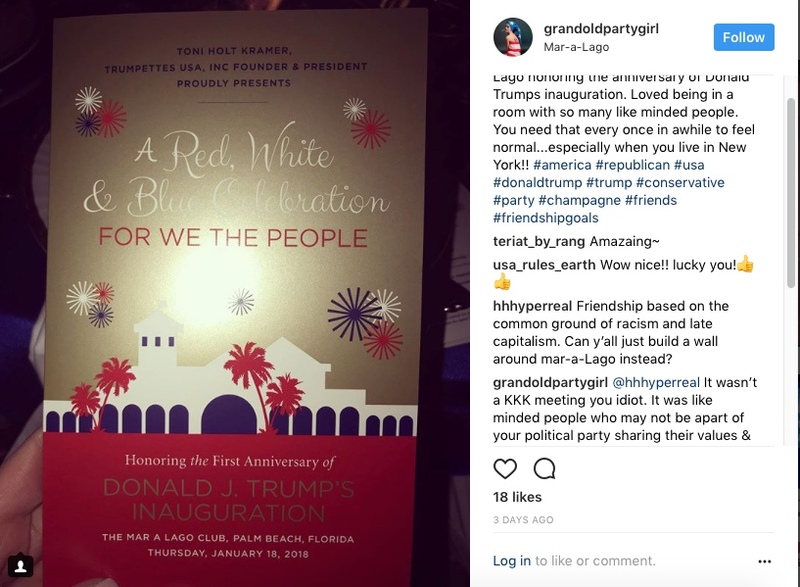 During the event – dubbed “A Red, White & Blue Celebration for We The People”- a social media embargo was imposed. 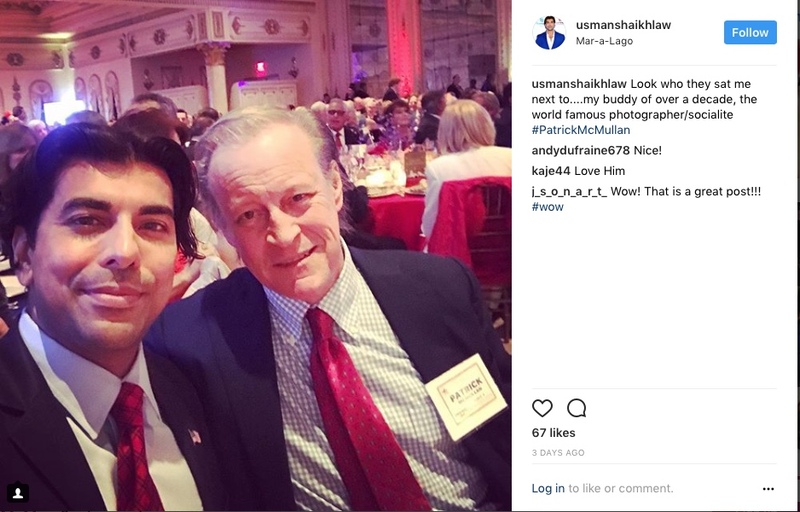 Nevertheless, I uncovered a few snaps on Instagram that seem to tell the story. Sarah Huckabee Sanders posted this snap from Washington, suggesting that Trump and the White House staff were working during the government shutdown. But why does DJT have his hat and coat on given that he works in the same building ? Where is he going? Why is everyone (except the guy to the left of the door) laughing? Why is there text in the upper left corner of the image? Something is very fishy about this picture. 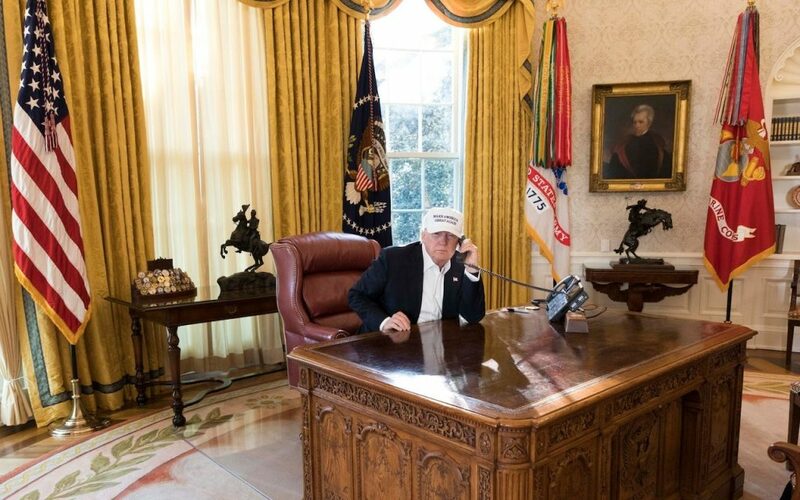 Here is another image from the Trump-is-still-at-work photo shoot. Are they trying a little too hard to make us think he is still in the White House…? 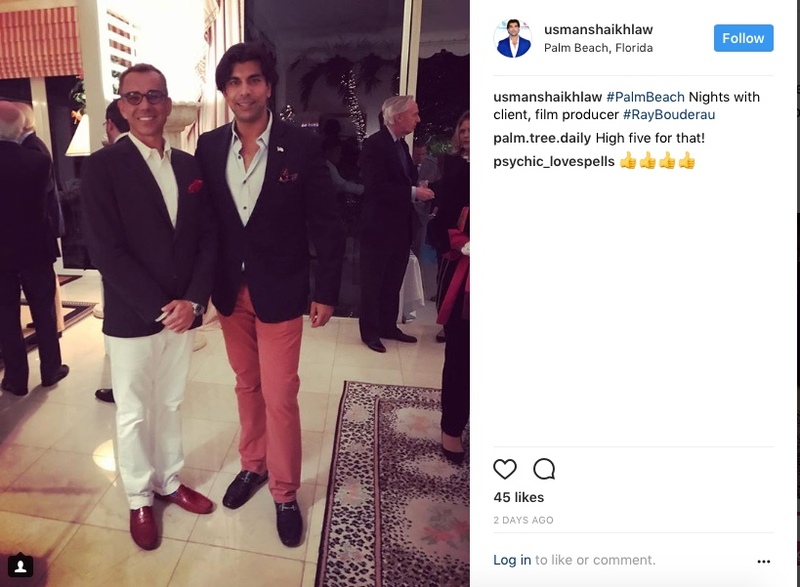 In case you thought no one in the entertainment industry supported Trump, here are Ray Bouderau and Usman Shaikh, two self-described entertainment guys. Bouderau is a Rockaway-born actor and producer and Shaikh is a Hollywood lawyer. Usman Shaikh posted a bunch of pictures. Here he is snapping a selfie with old-school NYC party photographer Patrick McMullan. 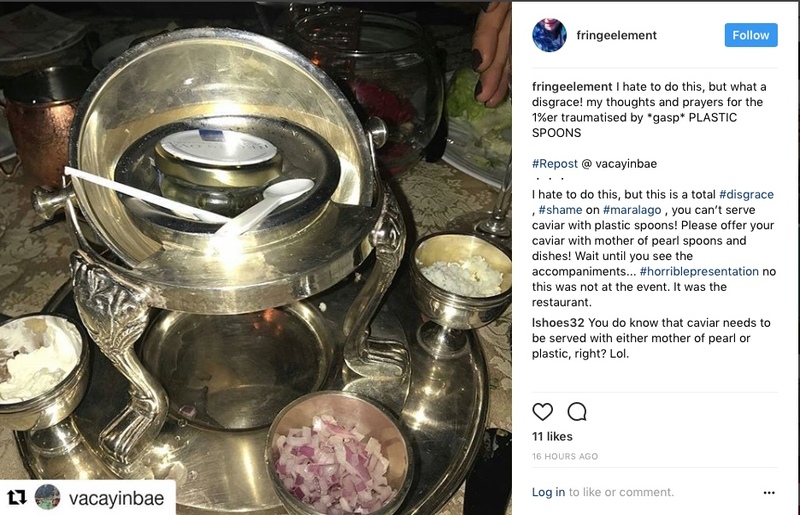 As was widely reported in the mainstream media, Vacayinbae was disappointed that she had to scoop caviar with plastic spoons. I’m not convinced this image wasn’t fake news. 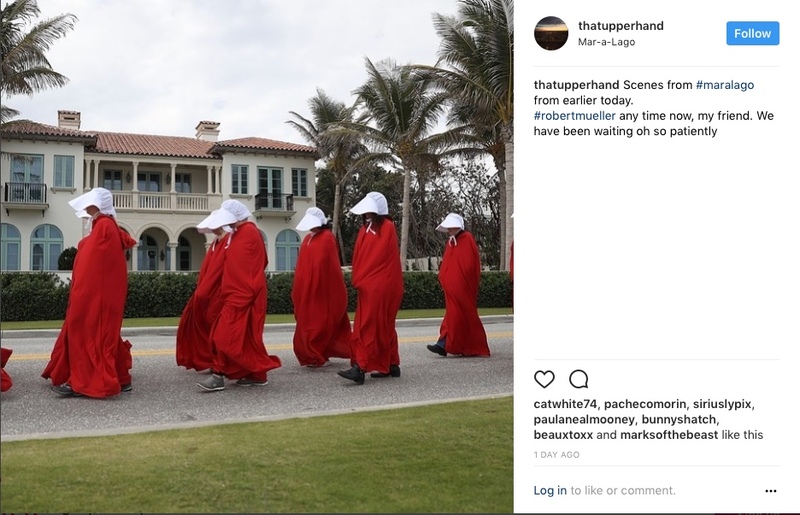 Outside the Mar-a-Lago gates, women, dressed in costumes to look like the breeders in The HandMaid’s Tale, protested the Republican’s retrograde policies and attitudes about women. Naturally, GOP red and flonde (fake blonde) were the colors of choice. 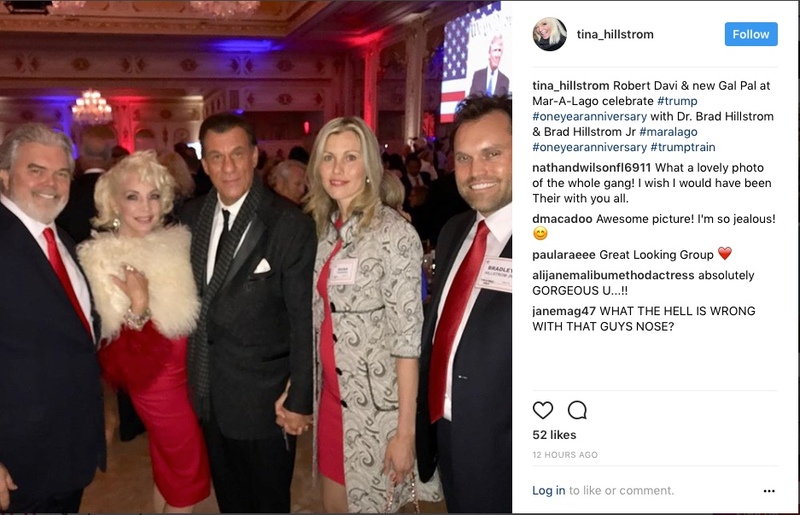 Reality TV-star wannabe Tina Hillstrom posted this snap of actor, Vegas lounge singer, conservative speaker Robert Davi (center) with her husband, Brad Hillstrom, and son, Brad Jr. The women aren’t identified. Note that Trump was featured on the big screen at right – not unlike Big Brother in George Orwell’s totalitarian classic, 1984. According to a report in The Guardian, they played a video message in which he tried to blame Democrats for the #TrumpShutdown. 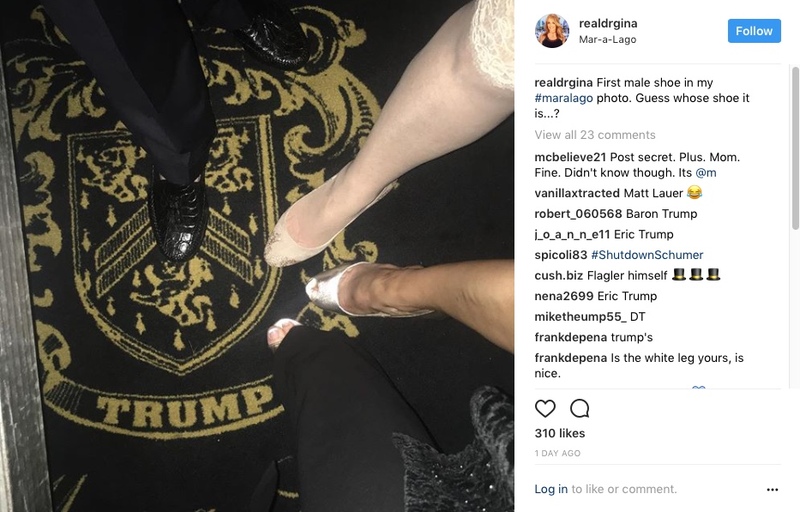 Dr. Gina Gentry Loudon, a self-described “TV & Radio Host psych•biz•politics on FOX News & biz bestselling author,” posted a picture of a man’s shoe, suggesting it might be someone important. Perhaps it was Donald? If it were anyone else, wouldn’t she have posted a picture of his face? Well, yes. That goes without saying, but thanks for the warning. 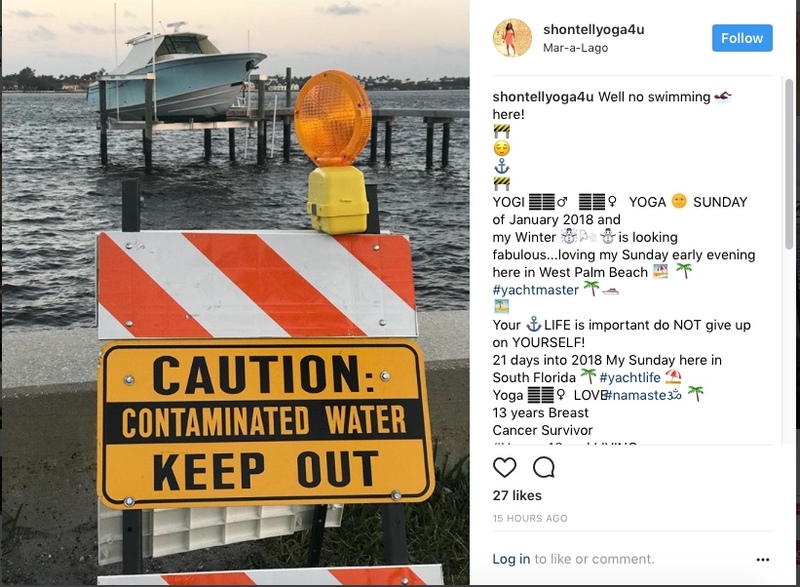 Sorry Floridians, with Scott Pruitt at the Environmental Protection Agency, don’t look for a clean-up any time soon. Love all the ways you find to describe the obscene Rumph gala. Could it inspire some of us to paint scenes from Hell? Thanks for the update. I decided to skip the party. We live in ridiculous times. I hope we survive them. 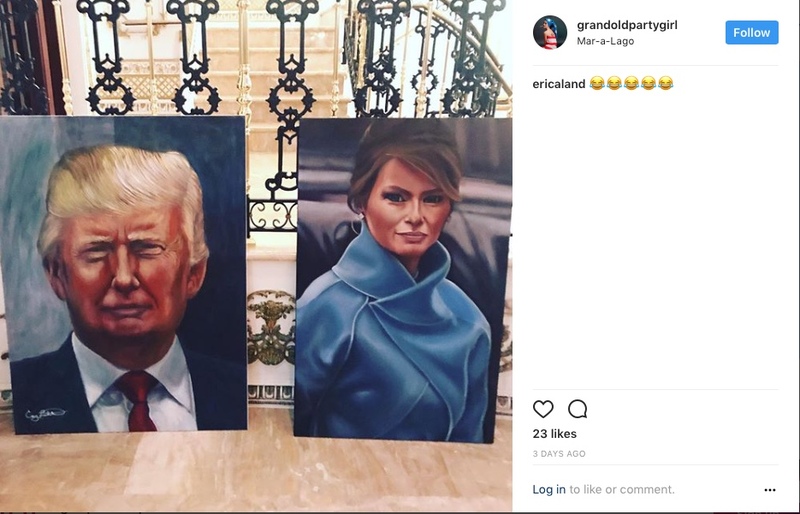 Do you really think the orange disaster skipped out of the White House to visit his Florida bordello?